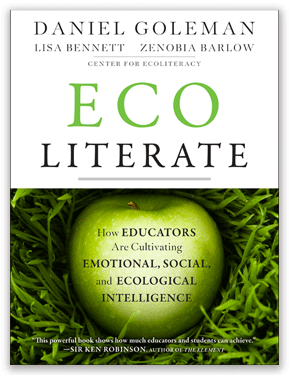 Ecoliterate: How Educators Are Cultivating Emotional, Social, and Ecological Intelligence is a practically focused book written by Daniel Goleman, Lisa Bennett, and Zenobia Barlow. The book is not only for educators and students, but also for parents and grandparents. It is a great source of information and real examples that anyone can use to help others visualize and understand the interrelations between human actions and natural systems. You will read about an Alaskan involved in protecting native communities in the Arctic wilderness from the impacts of oil drilling; a geography teacher helping nations solve water issues; and a coal miner’s daughter giving attention to the effects of mountaintop mining in Appalachia. You will also learn about people from southern New Mexico being inspired by a few young leaders to grow their own food. Understanding How Nature Sustains Life. All 5 practices are greatly described and illustrated in the stories. Following each of them can help create and strengthen relationships with people and our planet. The book offers ideas and strategies for educators to apply socially and emotionally engaged ecoliteracy to pressing ecological issues of the day. Ecoliterate can help people gain knowledge and understand their connection to nature. is graduated from the University of Wroclaw (Poland) in the faculty of Geography with a specialization in Social and Economic Geography. During her Master's studies, she did a semester abroad at the University of Groningen in the Netherlands. She loves live music, vegetarian cuisine, nature, traveling, and meeting new people. Her life motto is: "Be happy for this moment, this moment is your life."